These Ninja Turtles take on the Foot Clan with all new ninja battling moves. With these new battler features, these turtles can punch or kick their way out of any trouble that comes their way. No bad guys can take on these ninja moves! Figure Size :11x6x4 cm Brand New in Box. TMNT Nickelodeon Mikey Turflytle action figure Playmates. Item is brand new and unopened. You are purchasing a Used TMNT NICKELODEON LEO & DONNIE'SRaph & mikeys PATROL BUGGIES NINJA TURTLES lot S8! 1 Window Wipeout Play set. It's never been assembled or played with before. 1 gargoyle launcher. Build the city; Zip-Line action from wall to wall. 1 Angle Gauge. These buggies are used (maybe played with once or twice). One of the boxes has instructions. The gernade on Leo’s buggy is missing. These are interlocking buggies. TMNT Nickelodeon Werewolf Michelangelo action figure Playmates. Item is brand new and unopened. Card and bubble are in very good condition. You may find light shelf/storage wear. Requires 3 LR44 Batteries Not Included. Once the window expires an unpaid item case will be opened. You may need a magnifying glass to see these micro-mutant Turtles, but their Ninja skills and turtle power are still mighty enough to face off against their small-scale foes! 2017 Viacom international Inc.
Nice lot of 4 Teenage mutant ninja turle in nice played condition. You get what is in the pictures. They measure about 4.5" tall. Condition: Used. Accessories: All accessories displayed in the picture(s) are included. New and sealed in package. Please reach out with any questions. Tales Of The TMNT Nickelodeon Super Ninja Mikey action figure Playmates. Item is brand new and unopened. Minor edge wear. No idea what they did. otherwise minimal wear few scuffs. no idea what it does. or what's missing could use cleaning.I leave that up to new owner. 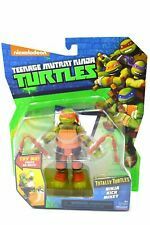 TMNT Nickelodeon Teenage Mutant Ninja Turtles Mikey Turflytle Figure IN HAND! He really puts himself out there trying to help the team, but he could be a sitting duck. or in this case, flying bat bait! No delays! No excuses! But you can get one here, sealed inside an unopened card ! Teenage Mutant Ninja Turtles - Shadow Ninja Color Change Mikey. Teenage Mutant Ninja Turtles - Shadow Ninja Color Change Mikey. Color Changes with Water! Savage Mikey Figure Only Teenage Mutant Ninja Turtles 2015 Series 15 Condition is Used. Shipped with USPS First Class Package. Tales Teenage Ninja Turtles Rookies in Training Leo Donnie & Mikey Raph Sets! No delays! No excuses! But you can get one here, sealed inside an unopened card ! Slight bend to the top of the card. Die Cast Chassis. You can collect the entire world of T-Machines. TMNT Nickelodeon Teenage Mutant Turtles Ninja Kick Mikey 5" Figure IN HAND! 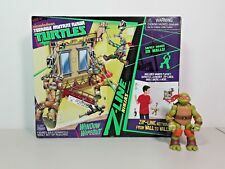 Nickelodeon animated series Teenage Mutant Ninja Turtles: Dark Horizons and a must have for any fan,Ninja Kick Mikey is harder to find than a sewer lair with a view! But you can get one here, sealed inside an unopened card ! TMNT Nickelodeon Spyline Mikey action figure Playmates. Item is brand new and unopened. Teenage Mutant Ninja Turtles Half-Shell Heroes Dojo Mikey with Training Bag. Condition is Used. Shipped with USPS First Class Package. NEW ON CARD AS PICTURED. TMNT Half Shell Heroes Mikey Action Figure 2014 Michelangelo Ninja Turtles 2.5"
Once the window expires an unpaid item case will be opened. Teenage Mutant Ninja Turtles Eye-Poppin Leo Tongue-Poppin Mikey 5" Figure Set! Nickelodeon animated series Teenage Mutant Ninja Turtles: Dark Horizons and a must have for any fan,Eye Poppin' Leo and Tongue Poppin' Mikey are harder to find than a sewer lair with a view! But you can get a set of each here, each sealed inside an unopened card! AGES 3 , MADE BY PLAYMATES . BETTER GET ONE WHILE YOU CAN. SAMURAI MIKEY. TEENAGE MUTANT NINJA TURTLES. MIKEY RALPH ROOKIES IN TRAINING Tales Teenage Mutant Ninja Turtles TMNT 2017 4"
MIKEY & RALPH. TALES OF TEENAGE MUTANT NINJA TURTLES. ROOKIES IN TRAINING. This item is very clean and has been examined thoroughly. Includes: 3 figures shown. Size: 4.25". Condition: Figures are missing parts and have some scuffing - see photos. 100% guaranteed to be received as listed. Teenage Mutant Ninja Turtles Savage Mikey Figure 2015 Nickelodeon TMNT. Item is New With Normal Shelf Wear.